Available for use in either our on-line store or in our retail store. 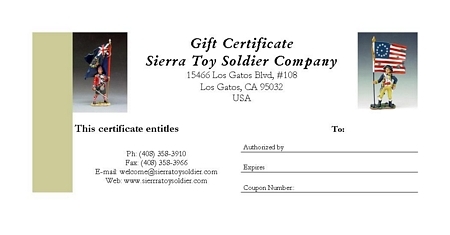 The Gift Certificates can be used to purchase any of our products and are available both via regular mail or by email. They can simply be redeemed by entering the coupon number in the the shopping cart coupon box. Seventy Five Dollar Gift Certificate. One Hundred Fifty Dollar Gift Certificate. Three Hundred Dollar Gift Certificate. Five Hundred Dollar Gift Certificate. One Thousand Dollar Gift Certificate.